Indian weddings are known to be grand affairs with multiple ceremonies and celebrations lasting days. The guest lists go into the hundreds and even thousands, and every detail of each function is intricately planned by the bride and groom and their parents to ensure that their family and friends have a gala time. From the food to the decor, dance routines to seating arrangements, the effort and expense that goes into a traditional Indian wedding is intense; but a wedding pulled off with aplomb is priceless to the married couple. It is a great celebration of love and the joining of two families. Perhaps one of the most looked into details of an Indian wedding is the attire, specifically the Indian bridal jewellery, which holds so much cultural symbolism and importance. From choosing engagement rings, to exchanging jewellery gifts to the elaborate jewellery sets purchased for the bride on her big day, bling plays a big role in every ceremony of an Indian wedding. Indian jewellery is known for its fine craftsmanship and intricately detailed designs. Indian jewellery designs are crafted infusing cultural and spirituality into each piece, keeping in mind the auspicious nature of a wedding along with the need to adorn a bride in grand finery so that all eyes are on her. 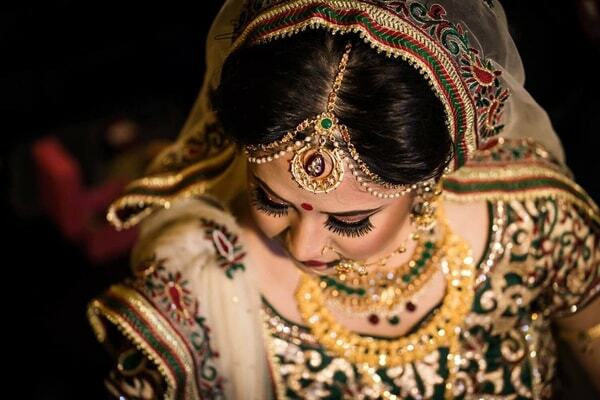 In all cultures, there are certain jewels that a bride wears according to religious or cultural customs. These jewels are worn to represent certain beliefs and make a bride look majestic and spectacular on her big day. With a traditional Indian Hindu wedding, jewellery plays a huge role, as many jewels feature in the Solah Shringar. 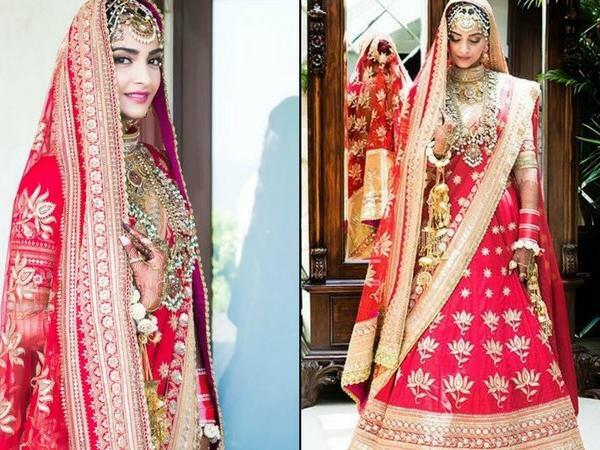 While garments vary from region to region, all brides tend to follow the Solah Shringar – the 16 essentials items that every Indian Hindu bride should adorn herself with on her wedding day. This list of items – which aim at enhancing a woman’s look from head to toe – is thought to intensify a bride’s beauty and includes a good deal of jewellery. We delve into the significance and beauty of Indian jewellery that is essential to a traditional Hindu wedding. The Maang Tikka is regaining its former glory as modern brides go back to their roots and appreciate this beautiful bridal accessory. This piece of jewellery is a part of the bridal set so will be in the same gold and design as your necklace, earrings, etc. Meant to be worn across your center-parted hair and hung down toward the forehead, the Maang Tikka looks beautifully Indian and can be chosen in a size to suit your face. Go with a heavy, impactful Maang Tikka if you have a larger forehead. For those with smaller foreheads, smaller, delicate ones look more appropriate. It is believed that the pendant part of the Maang Tikka rests on the area of a woman’s head that houses the agya chakra, which stands for preservation. This represents a union of the bride and groom on an emotional, physical and spiritual level. A piece of jewellery, also known as haar, that no bride should go without, the Indian bridal necklace is also known as the haar and is often a grand design. Where traditional these necklaces were only crafted in gold, more modern pieces feature stunning designs that include diamonds, pearls or coloured gemstones set in not just yellow gold, but white and rose gold as well. In fact, Indian diamond jewellery is fast gaining ground with fashionable brides-to-be looking to sparkle on their big day. The necklace is meant to cover the bare area of skin above the bride’s neckline and is usually rich in detail and large in size to emphasise glamour and majesty. The mangalsutra, crafted in gold with black beads and sometimes featuring diamonds, is another important necklace worn by brides from most parts of India on the wedding day and after to indicate marriage. Each community who has this tradition has their own design of the necklace. The earrings have to perfectly match the necklace, of course. The beautifully coordinated designs of all the Indian wedding jewellery adorning the woman is what makes an Indian bride such a magnificent sight to behold. Most Indian bridal earrings, like the necklaces, tend to be on the heavier side to match the set, though some brides prefer more delicate pieces for comfort as it has to be worn through the whole day. Make sure to choose your earrings and all your jewels with your wedding outfit in mind, For example, diamond jewellery suits pastel-shaded wedding sarees or lehengas extremely well. Fabric in shades such as light pink, baby blue, aqua or mint green goes very well with the fantastic sparkle and sheen of diamond and gold jewels. Yellow and white gold suit the more traditional red and maroon wedding outfits; a stark and beautiful contrast of bright gold beauty against the richly-hued fabric. 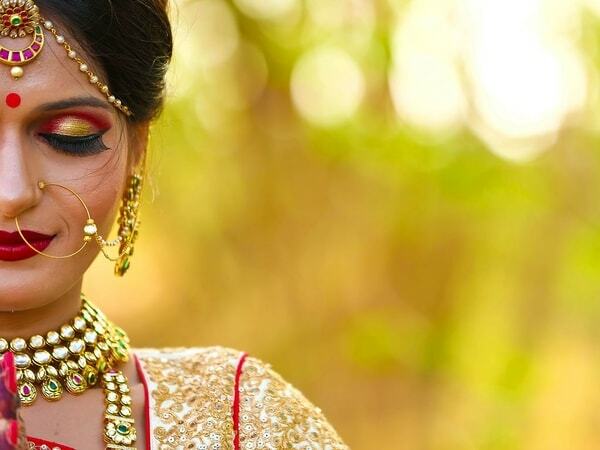 Although it is now popular all over the world as a fashion accessory, wearing a nose ring, or the nath, is an important part of Indian wedding jewellery for brides as it is a symbol of marriage. In Hinduism, a nose piercing is thought of as an ode to the Goddess of marriage, Parvathi. 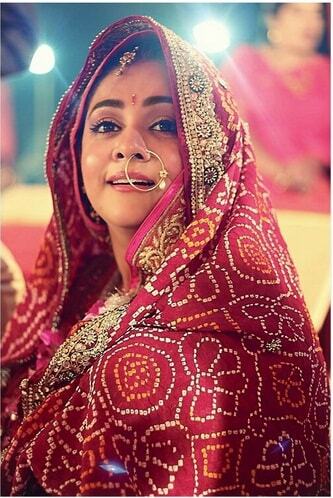 In a few places in India, nose rings are worn only by married women. But not all brides are comfortable wearing nose rings though and many opt out. You can choose to wear a tiny stud or an elaborate ring that connects to your earring by a decorated gold chain; how big you go depends entirely on you. If you have not pierced your nose but still want to complete your wedding look with a traditional nose ring, there are a whole range of good-looking clip-on varieties that you can purchase. Ask any bride-to-be and they will tell you that no Indian bridal outfit is complete without bangles. These are perhaps one the most noticeable jewellery pieces on the bride. 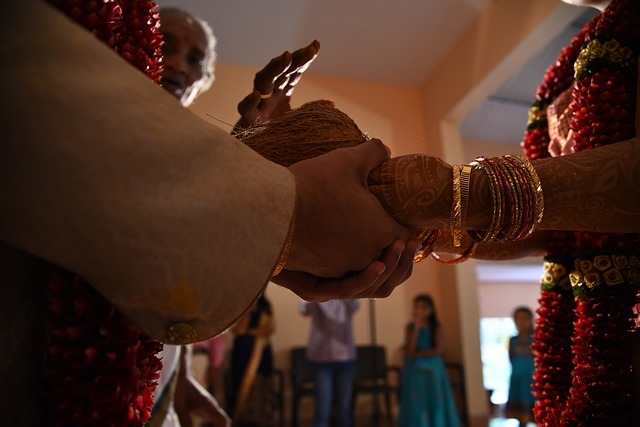 In fact, all over the world, North Indian newlyweds can can be spotting with forearms’ worth of telltale chooda still adorning their hands on their honeymoons as they are meant to keep the jewels on for a year, or at minimum at least 40 days. 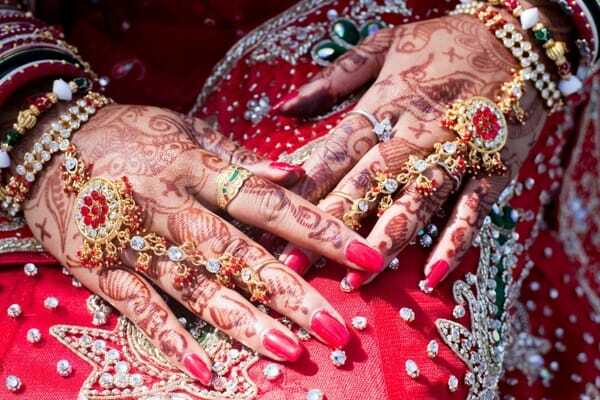 In Indian culture, it is said that after marriage, a woman should not keep her arms bare. Bangles are also said to represent the luck and well being of a woman’s husband according to some Indian traditions. Brides either wear diamond and gold bangles, metal bangles, or glass bangles in bright colours like reds and greens. The number of bangles you need to wear will vary according to the traditions of different regions and sects in India. A bride’s fingers are decorated with rings to emphasise on her already opulent look. Usually, she will wear her engagement ring as well as a ring that matches her earrings and necklace from her wedding jewellery set. In addition to these, she can choose to adorn any or all of her fingers in jewels to match her outfit, such as jewels with colours gems, or rings with some sentimental significance. Looking to buy the perfect wedding bands? Our top tips to picking wedding bands is all you need to find ‘the ones’. Also known as a payal, the anklet’s beautiful and gentle sound, the tinkling of small bells, is an announcement that a new bride is arriving. Along with toe rings, this delicate and musical jewel succeeds in beautifying a bride from head (with the Maang Tikka) to foot. Toe rings, or bichiyas, are popular in South India and are regarded as a symbol of marriage. These rings are worn on the second toe of each foot and, just like a wedding ring in Western cultures, lets people know if your marital status. Once on, a woman is not supposed to take off these toe rings until after her husband dies. Traditionally known as the kamarband, this bejewelled waistband is usually crafted in gold and draws attention to and decorates the bride’s bare torso, enhancing her natural feminine curves. While the kamarband has not been extremely popular with brides in the recent past, it is quickly regaining popularity for its unique and sensual look. Indian jewellery designs are intricate yet elaborate, with fine craftsmanship and utmost attention to detail producing Indian jewellery sets that are perfectly matched and look beautiful with bridal wear. Above are the most important pieces of jewellery that Indian brides traditionally wear on their wedding day. Of course, traditions and customs vary from region to region in India. These items only outline what Hindu brides follow when it comes to picking their Indian wedding jewellery. 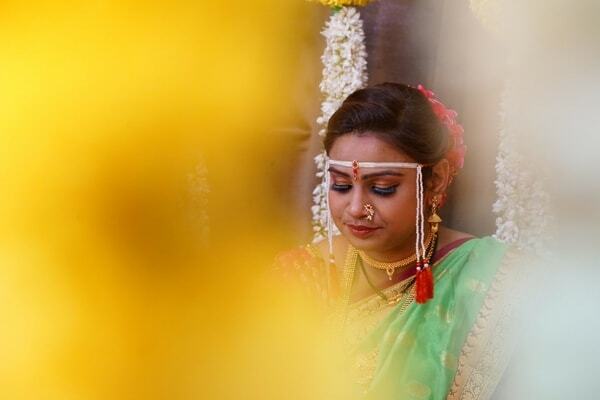 Weddings and accompanying traditions are big in India. No matter how much the country has modernised, Indian weddings still remain traditional and the sanctity of the Indian wedding customs and rituals is not to be trifled with. Open any page of the Indian bride’s wedding diaries, you will find her obsessively working out every detail of her wedding look, attire, Indian jewellery and accessories. For centuries, the wedding day has been one of the most significant days of an Indian woman’s life and her Indian wedding jewellery sets are the first, the foremost and the most integral component of her wedding saga. As diverse as India is, its bridal jewellery, styles and traditions are even more versatile and distinct. We present the bridal jewellery essentials from different regions of India. Wherever she comes from, the Indian bride is a show-stopper. The bride from Rajasthan is no less than a queen on her special day, adorned in Indian diamond jewellery. She wears a ‘Rakhri’ on her head which is shaped like a tiny bell. Her neck is adorned with Aad, a choker necklace which is a unique Rajasthani design along with a longer gold and diamond studded necklace called Raani Haar or Queen’s necklace. You can read more on buying diamonds here. She wears a ‘Bajuband’ on her upper arm, ‘Hath Phul’ on her wrist along with the ‘Chooda’ and gold anklets called ‘Bichiya’. Her nose is adorned with a circular ‘nath’. These ornaments are designed in intricate age-old Rajasthani designs. 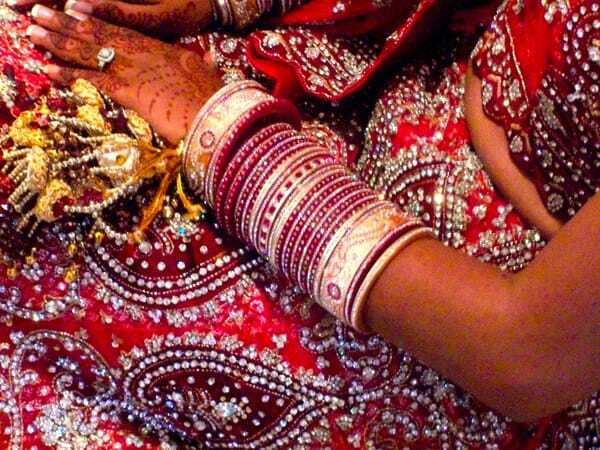 The unique thing about a Gujarati bride’s wedding attire are her colourful glass bangles or ‘Bangdi’ of white, green, red along with gold ‘Patlas’. She usually wears a Kundan jewellery set, which is the oldest traditional jewellery design style of India, which includes Kundan Butti, earrings hanged from earlobes and Kundan necklace. Chandan Haar is yet another essential for a Gujarati bride, an elaborate work of pure gold chains. ‘Kandora’ is a waistband to hold her saree together. Proud of their gold, the Maharashtrians have to go all out with their wedding glitz and elaborate Indian jewellery designs. The most defining piece of Marathi bridal wear is the ‘Mundavlya’ which is worn by both bride and bridegroom and is a string of pearls worn on the forehead with strings dropping down both the ears. This is accompanied by a pearl nose ring. Brides wear ‘Kolhapuri Saaj’ a gold necklace of beads with a ruby pendant, in addition to a choker necklace called ‘Thushi’ and a longer one called ‘Chaplahar’. They wear green glass bangles with gold kadas called ‘Gahu Tode’. The ‘Chooda’ the brides wear is made up of red glass bangles and embellished kadas. 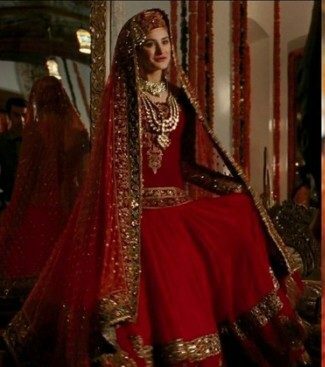 The striking thing about a Punjabi bride is the ‘Kalire’ which is attached to her Chooda. These are long, ornate, dangling ceremonial accessories. 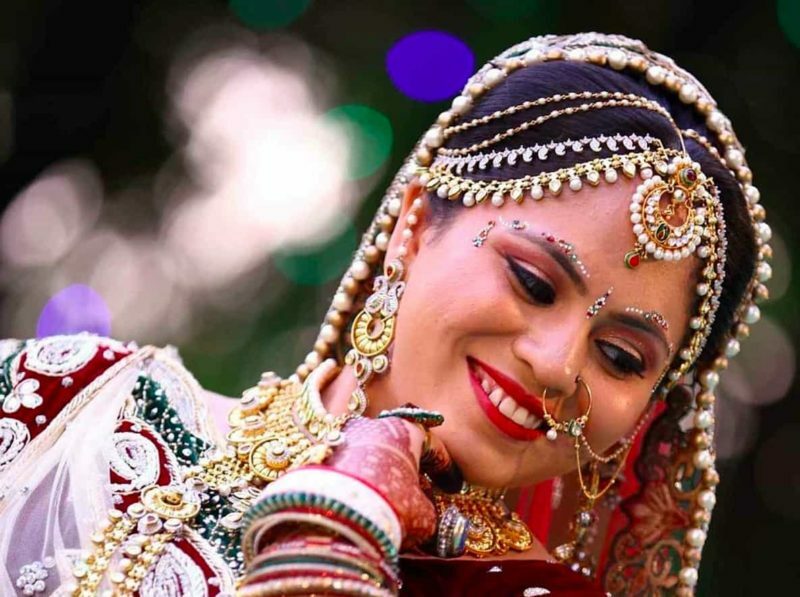 Brides also wear Kundan choker, Manek Chudi and large to medium nose rings. An elaborate pendant mang tikka is also worn. A typical hand adornment ‘Shaakh Pola’ is worn by Bengali brides which are made of conch shells. They also wear a special ‘Mukut’ or crown on their foreheads paired with a ‘Maatha Patti’ or mang tikka and elaborate sandalwood bindi decorations on her forehead. They wear chandelier earrings known as jhumkas. Traditional thick and elaborately designed Bengali gold bracelets are called ‘Churs’. Additionally, they wear ‘Paati Haar’ a flat necklace and ‘Cheek’ choker necklaces. Yet another community that takes its gold quite seriously. Malayali brides are laden in various gold ornaments, including the ‘Mullamottu’ mala which is a long, patterned gold necklace. A minnukettu is Kerala’s version of a mangalsutra which all brides wear. ‘Kasu Mala’ is a necklace made of gold coins. Another favourite of brides is ‘Palakka Mala’, a leaf necklace made of emerald and gold. ‘Jhimkis’ are worn in the ear, a bell-shaped pair of earrings. Temple jewellery is usually worn, which features idols gods and goddesses in precious stones. A heavily adorned kamarband is a mandatory feature over their traditional Kasavu saree. Dressed in a heavy Kanjeevaram saree, the Tamil bride always wears an ‘Oddiyanam’, a waist belt made of silver and gold. Sun and moon-shaped hair ornaments they wear are called ‘Suryapirai’, while ‘Nethichutti’ is a huge and colourful decorative forehead ornament. She wears a ‘Vangi’ an inverted V-shaped arm bracelet. 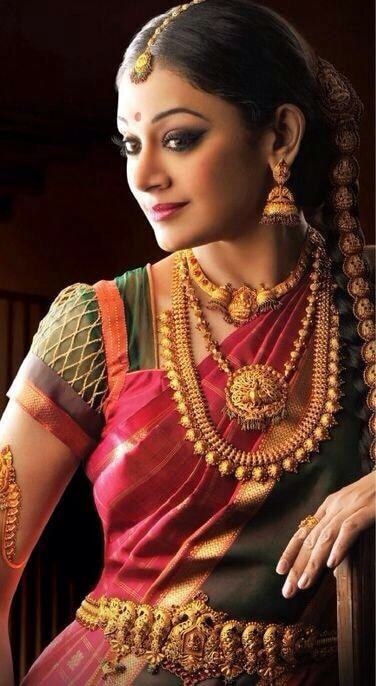 Perhaps the most outstanding piece of jewellery she wears is a ‘Jadanagam’ or ‘hair serpent’ to cover her braid. Thick, large exquisitely designed hand bangles called ‘Valayal’ are also mandatory. The bride from Karnataka is close to the image of Goddess Lakshmi. They were intricately designed ‘Netrichutti’ maang tikkas on their foreheads. Brides are known to wear a layered gold chain called ‘Entele Sara’ along with a heavily embellished ‘Lakshmi Sara’, both must-have necklace essentials. Special gold and gemstone chandelier earrings are worn which are known as ‘Muthinavale Jhimki’ along with ‘Guruvina Kada’, traditional bangles made in Karnataka. A mango motif necklace known as ‘Mavinakayi Haar’ is also worn. Simple and elegant, the Assamese bridal look is defined by handmade jewellery called ‘Jun Biri’ or half-moon pendant. This special set of necklace and earrings are inspired from nature, cultural icons and other motifs. They are decorated with coloured gemstones and gold. 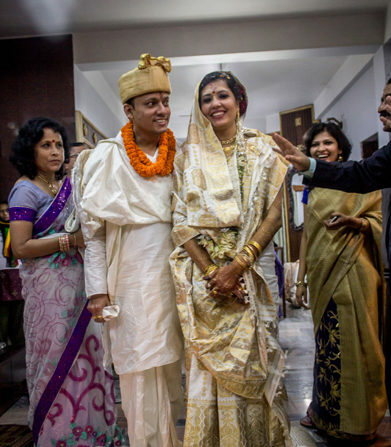 Some Assamese brides also wear a ‘Mukut’ like Bengali brides. 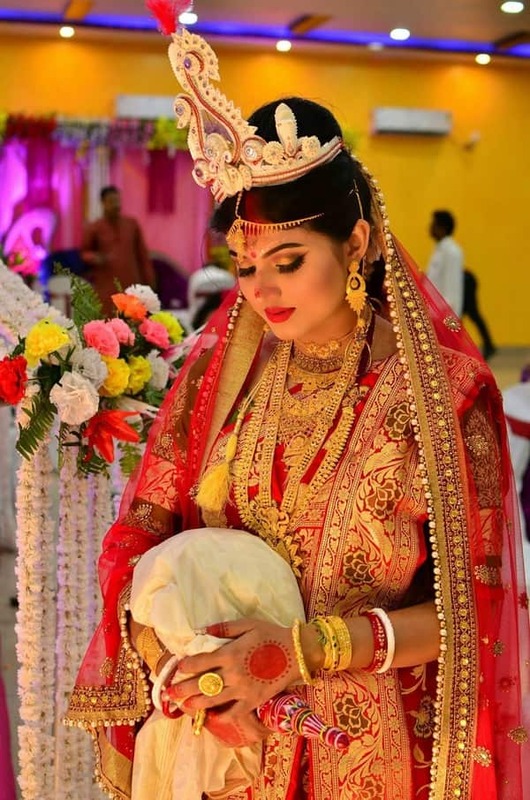 ‘DholBiri’ is yet another curious trinket worn by Assamese brides. It’s a drum-shaped locket. A bride like none other, a Kashmiri woman wears a halqabund, a large choker made of silver, gold and brass in interlocking patterns. It is sometimes studded with rubies, diamonds and other precious gemstones. Another singular piece of headgear is called ‘Kalpush’ a cap folded a few times over which is a white cloth, forming a Tarang. The bride wears her mang tikka right under this headgear. Multi-coloured bangles are a distinctive ornamental feature of a Bihari bride. The forehead jewellery is called ‘Tikli’ which is glass-finished and delicately designed. Most women wear intricate gold necklace called ‘Chandrahaar’. Other types of regularly worn necklaces during weddings are Panchlari, Satlari and Sikri. Large nose rings and gem-studded chokers are also commonly worn. Bridal jewellery wear is the bride’s pride and joy, across regions, castes and cultures. Which look is your favourite? Let us know using the comment section below. Looking to clean your gold jewellery? Read these easy and effective ways to clean gold jewellery at home. Looking for jewelry sets for bride. Is Kundan jewellery a good option? What is a gold mukut for bride? 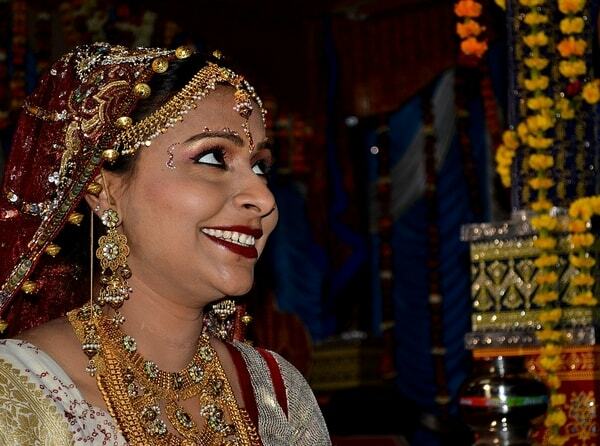 The mukut is a type of traditional tiara that is worn by a lot of Indian brides. Its shape and sizes vary and design and styles differs according to region. Materials also vary according to traditions. What should I do if kundan jewellery turns black?